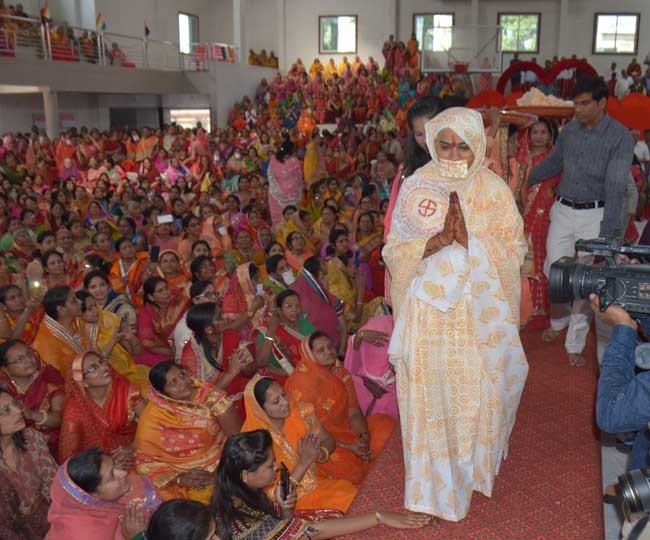 22-year-old Haryana girl Simran Jain has renounced all the materialistic things and relationships and has decided to become a monk. Now onwards no relations even her father or mother will be anymore her relative nor she will desire any materialistic wealth. It is a tough decision and at this tender age, she has decided to renounce all the things behind the common masses are running. She has attained nirvana and n matter how much her parents wanted her to persuade for not doing this she denied all their requests. She was firm that she will renounce the world and did so. Monday, in Indore’s Basketball Complex her “Diksha” function took place. Her parents were all in tears and her father had always wanted to educate her and then get her married off, but this was not destined. She is well educated B. Sc, Computer Science graduate but her decision to become a monk had stunned all. In a procession that started from Mahaveer Bhawan, she was seated wearing the best of outfit and hands designed with henna. She resembled a bride but soon would give away all these and never get back to them. Gautam Muniji another monk from the Jain community has given her new name as Mahasati Shrii Gautamiji. After she reached the venue of “Diksha”, she gave all her jewels to her mother symbolizing that she has renounced it all. After thin,s she went bald in front of all. For the ceremony, all her favorite meals were cooked that was consumed by others present there and not her. She agreed that renouncing the world is not easy but even after having all the materialistic desires and traveling to beautiful locations she never had peace of her mind. She found solace only when she left back all these and got her soul connected to the Supreme Power.